If anyone doubted that spring was well and truly here, this last two weeks should have convinced them. Even Cabernet Sauvignon, one of the later varieties around here, is at advanced bud swell. 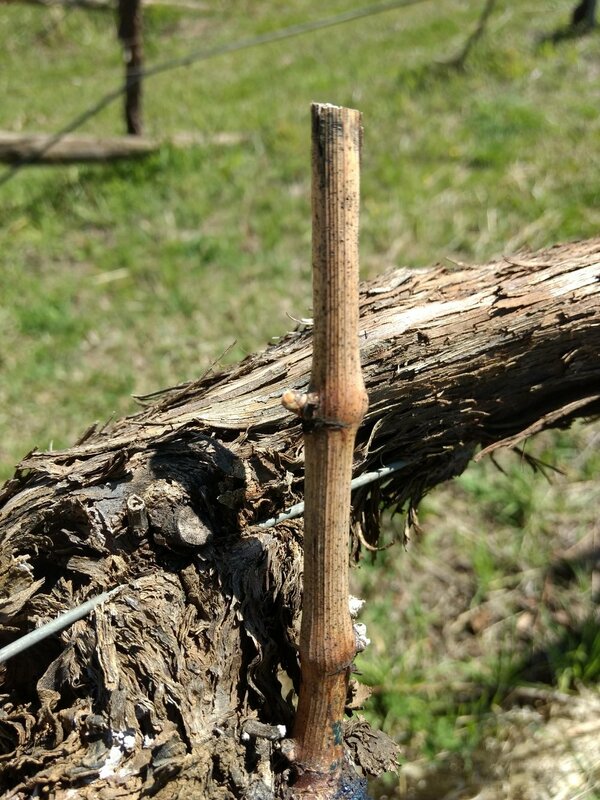 By this time in the progress of viticultural events, we have a fairly good idea of the potential for next vintage. Bud break has been kind; an examination of the odd popped bud shows that there are a high number of embryonic inflorescences which will develop into delicious fruit over the next six months or so. The biological potential for vintage 2019 is there already, although it would be a foolish person who cracked open an Australian sparkling white just yet. Pruning, tying and re-trellising, tasks which were started as long ago as the Anzac holiday weekend in April, are nearing completion for this season. After a couple of recent showers, the lush spring growth of grasses and broad-leaves across the vineyard floor is re-invigorating the biota, and the first sprays of organic Copper and Sulfur on the new buds have been applied. God is in her heaven and all seems right with the Bloodwood world view this early spring 2019. So what could go wrong? Plenty! On the way to town one calm morning last week, I missed a beat. There, in a paddock of healthy pasture, were a set of parallel tracks heading straight up a hill. Twenty meters on, the same tracks headed right back down again. This pattern repeated itself across the whole paddock with the exception of a detour around a water trough and the one enfeebled paddock tree. This was cause for great concern. I'd actually witnessed this neighbour topdressing with super phosphate earlier in the winter so I knew they weren't spreader tracks I was looking at. I pulled over to the side of the road and wound down the window. The slightest of sniffs confirmed my suspicions. The stagnant, pungent odour of newly applied hormone based spray was everywhere. This is one ester that doesn't excite a winemakers nostrils. These volatile herbicides can destroy sensitive broadleaved plants like grapevines from an incredible distance under certain conditions. Given a warm day and not too uncommon thermal currents that can develop, these volatile compounds have been shown to destroy grapevines many kilometers distant. One such historical case in the Riverland of South Australia involved an application 21 kilometers away, and resulted in the severe loss of crop from a large vineyard. This loss carried over into three seasons, and the damages bill was well over the million dollar mark. Along side the more recent and seriously problematic glyphosate, these volatile weedicides have been used in traditional cropping and grazing enterprises for over sixty years, and they offer cheap means of controlling broadleaved weeds in grass pastures. Their action is not dissimilar to that of cancer, in that they encourage abnormal rates of growth at the cellular level, which, in a very short time, leads to structural collapse of the broadleaved plant. It is ironical that the very low dose rates used in pasture topping are potentially more dangerous to vines than the concentrate is itself. Whereas the concentrate will kill all vegetation immediately upon contact, in so doing, there is less avenue for translocation within the plant. At very low dose levels however, the chemical, to use the cancer analogy once again, gradually infiltrates the whole system of the plant, destroying it as it moves slowly through the tissues. So please, if you are misguided enough to mechanically insist on using chemotherapy treatments in your farming environment, please be aware of your local emergant grapegrower or orchardist when dousing your environment with poison. We think we were lucky this time, but disaster is only a careless spray away.